Tokneneng is one of the popular street foods made from chicken or duck eggs, coated with crispy orange colored batter. The smaller version is called kwek-kwek which are made from quail eggs. Although this is very popular, yet many are confused which one is tokneneng or kwek-kwek. I’m one of those confused people before but with a little research I found out that kwek-kwek is made from quail eggs while the tokneneng is the bigger brother made from chicken or duck eggs. If you will ask my opinion, I like the taste of tokneneng made from duck eggs than chicken eggs. When preparing the batter, it is a little tricky because you might be tempted to add more water (because it will take some time for the water and flour to mix) and the result will be a very thin consistency which will not coat the eggs well. If the batter looks too dry at first, mix it very well and add water a teaspoon at a time until you achieve the correct consistency. And about the dipping sauce, this is already tried and tested in the past when we are still selling tokneneng in our food cart before. Actually this is also our home recipe dipping sauce for fried tokwa or tofu. 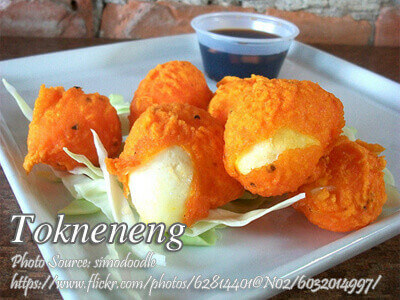 Tokneneng is one of the popular street foods made from chicken or duck eggs, coated with crispy orange colored batter. Boil the eggs in water for 10 to 15 minutes and add a little salt. Don't cover the pot while cooking the eggs to avoid cracks on the shells. Drain the eggs and put tap water to cool. Peel the eggs and coat with cornstarch. Set aside. To make the batter; in a bowl, mix the flour, salt, pepper and water. Mix the batter using a fork or an electric hand mixer and mix until all the lumps disappear. While mixing, add a few drops of food coloring if you are using liquid coloring or if powdered, start with a small amount until the desired orange color is achieved. In a deep frying pan, heat enough oil to deep fry the eggs. Put the eggs in the batter and use a spoon to scoop the eggs from the batter then put it in hot oil one by one. Don't overcrowd the pan with eggs. 3 to 4 eggs per batch is enough to avoid the battered eggs from sticking with each other. Fry until the batter is crispy and remove from pan using a slotted spoon. Drain with paper towels or use a strainer to drain excess oil. Serve hot with dipping sauce. To make the dipping sauce; just combine vinegar, soy sauce, sugar, onions, water and chili. Mix very well until all the sugar is dissolved. Hi Faith, as I’ve mentioned in my post that preparing the batter is a little tricky. The batter is supposed to be thick but if it is too thick, add a little water about 1 teaspoon at a time then mix again. The batter should stick to the eggs because you should coat it first with cornstarch. Did you coat it with cornstarch first before dipping the eggs in batter? Anyway I’m happy that you liked the tokneneng recipe! Cheers!